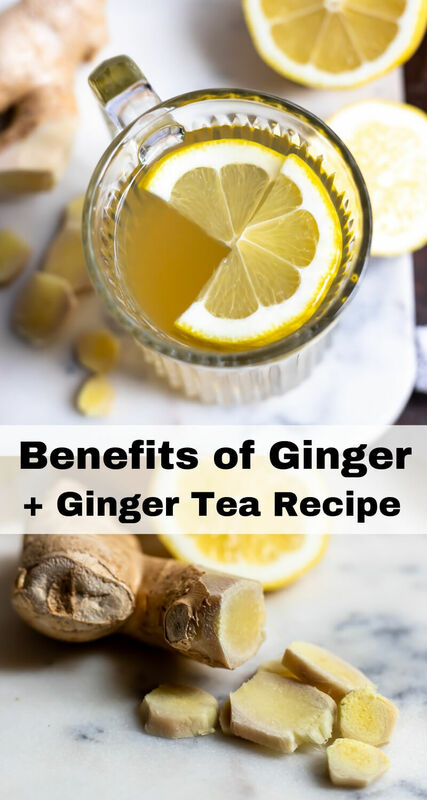 There are so many Benefits of Ginger and this Ginger Tea Recipe is a great way to take advantage of the health benefits. 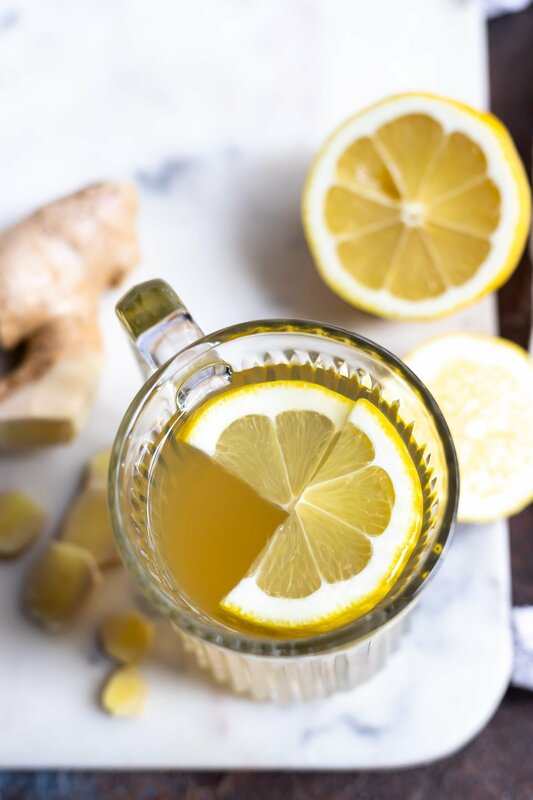 A simple blend of fresh ginger, honey and lemon make this natural healing tea super tasty. Cheers to your health. I am NOT a doctor. Just wanted to get that right out there. While I think nature gives us a lot of healing plants, herbs and roots…you always want to check with your doctor about any issues of concern. But using modern medicine along with ancient medicine just makes sense. I use ginger, cayenne, garlic, turmeric and coconut oil for health purposes on a regular basis. 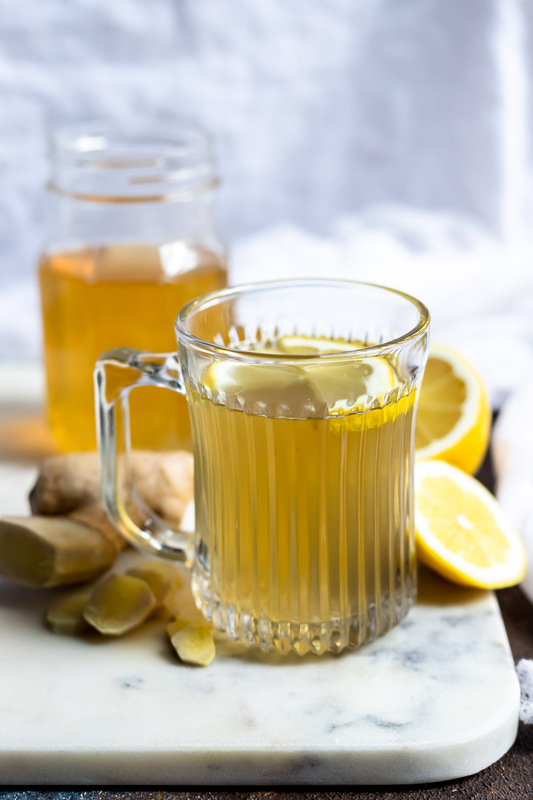 Ginger Tea is great because it has some health benefits and also tastes fantastic. This tea is warm and soothing. It does in fact have a calming effect on mild tummy troubles which is the main reason I make this tea, basically to keep my digestive tract mellow. Ginger comes from a flowering plant that grows long stems that are reed-like. The ginger used in this tea and for cooking is actually the underground horizontally growing plant stem, known as a rhizome. That is why it is sometimes referred to as Ginger Root. Typically calms the digestive tract and can help with nausea. Freshens breath and helps to clear the sinuses. Boosts your immune system and helps to fight off colds. Can cause heartburn or stomach irritation is some people or if consumed in large quantities. 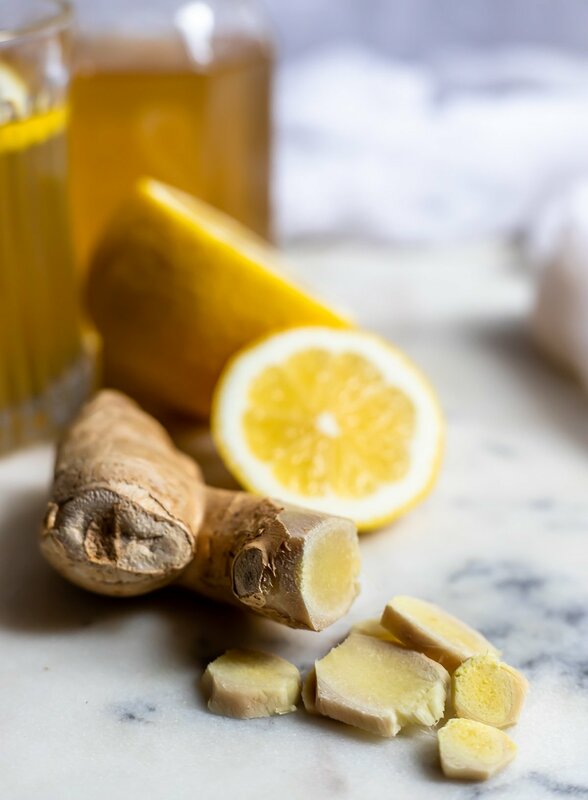 Ginger can interact with certain medications. Talk to your doctor before adding ginger to your routine. Ginger has blood thinning qualities. This is good for circulation but can cause issues if taking blood thinners. 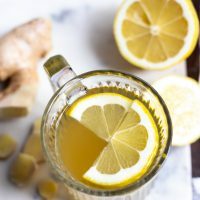 Ginger is also on the Do Not Consume List prior to any surgeries, for this reason. I wish. It is touted as a weight loss tea. Perhaps with a healthy diet and active lifestyle this tea will assist in weight loss. (Don’t you just hate when they say that!) But really its the diet and exercise that will be causing the weight loss. Sorry, there just isn’t any miracle drink that is responsible for weight loss. If there was I’d be the first to hop on that bandwagon! Step 1: Wash and peel 1-2 inches of fresh ginger then slice. Add ginger and 4 cups filtered water to small pot. Simmer for 15-20 minutes. Step 2: Remove ginger. Add a pinch of sea salt and 2-3 Tablespoons honey. Serve with a slice of lemon. In small pot, bring water and ginger to a simmer. Let simmer 15-20 minutes. Remove from heat and let cool 2-3 minutes. Remove and discard ginger slices. Stir in salt and honey until dissolved. Serve warm with a slice of lemon. This recipe yields approximately 2 cups of tea due to half of the water evaporating during the preparation. To make it easier to make, we take a lot of ginger, grate it, and then use a tablespoon to tightly pack little ‘hay stacks’ of the grated ginger, and then put them on wax paper on a cookie sheet to freeze. Once frozen, put in a container or bag and keep in the freezer. We use unbleached tea bags, pop one in to defrost, pour boiling water over it and cover and let sit 15 minutes. Easy tea!